So you all heard Tova talk about face shape in her last post, right? I want to show you an example of my experimenting with height and angles in a way that did NOT suite my face shape! (And certainly doesn’t work with my personality either!) Please note that I have a long face, pointy chin and nose… and generally look best in softer angles and shapes, with more volume at the sides instead of on top. This style would be great for someone that wants to enhance the angles of her face and make it look thinner. This wrap would look AMAZING on someone else with a different personality, but not so much on me! I snapped these photos as an example, but immediately changed into a much softer and more comforting wrap which suits my face shape and personality better. Whew! 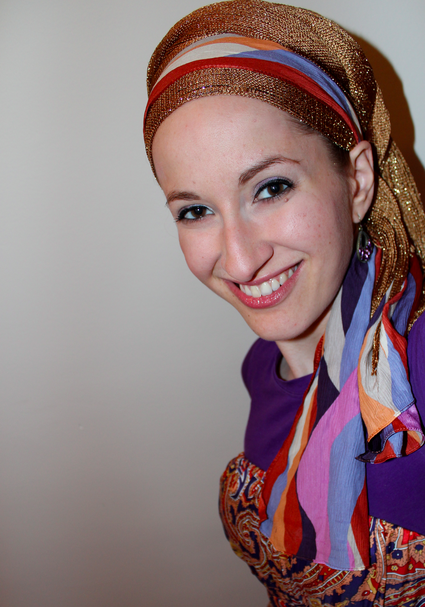 At Wrapunzel we want to teach you to look YOUR best in a tichel! This means that you might see a photo of someone else and they look AWESOME, but that look may not be right for you! We’d love to hear in the comments, what are some looks that just don’t work for you and why? And what have you learned from your experimentation? I really see what you mean about the height and angles changes the contours of your face. As they say, a picture is worth a thousand words. Thanks. Altho the brown and blue is very pretty, the brown wrapping is finer and does look better on you. Loved this post. I agree with you, some face shapes suits with some more creative wraps. I think my face is like yours: it asks for more simple wraps, if you can understand me. I love your wraps! I would LOVE to try a wrap like the first one and see how it looks with my face shape. Do you know of any tutorials for similar wraps? I actually like both sorts of looks on you- but the first one is a very different presentation of self. Stll, keep it in your back pocket if one day you want to do drama or feel different one day- because you can totally carry that look. Maybe for a Purim-related time when you don’t want to do a full costume, if nothing else. Thanks for these face shape posts (I think I was one of the ones who asked for this on Facebook a while back!). My face is more oval/oblong rather than angular, but I also wear my fringe out which ‘fills’ in some of the forehead…so for tichels I find smaller wraps (e.g. square scarves or long scarves without too much height) works best. I fill in the layers with sashes/headbands instead of full scarves where possible. Also don’t use a shaper, so trying to avoid anything too fancy at the back as it often doesn’t stay neat! If I am getting hair pulled out from right under where the velvet headband velcros together, what am I doing wrong? You are probably doing nothing wrong. It’s just the nature of Velcro to cling and the nature of hair to drift where it’s not wanted. I have more of an issue with the Velcro clinging to a 2-in-1 when I take it off. Maybe just some hair that come out because it’s too short to stay in: just bobby pin it before having the non-slip headband on top of it! The first wrap is just a strange wrap. I’m not sure who it would look good on. The second and third example are more of what I’m used to seeing. Believe it or not a girl posted a photo of her wearing the first wrap and it looked AMAZING on her – but she was dark with strong eyebrows and round cheeks/chin – totally different from me! i think you look beautiful in both and I also agree with Aliyanna…wear what YOU feel comfortable in. Also would love a tut on the brown/aqua as I think I would look pretty decent in it. I seem to gravitate toward “high” on the head bulk. I love this site! I am experimenting w/ different styles. My face is more oval and so far I fund a big elegant bun in the back or a bun w/ braids weaved around works best. I have to try the tails hanging. haven’t figured out how to make that work yet. Thanks for all this great info. Tova’s talk was awesome! Regarding the Velcro pulling out hair and tichels,it’s happened to me and is very painful! I’m sure now to connect the Velcro more carefully so that it doesn’t hang out at an angle. Also, when I put on the volumizer over the band, it secures the straps more so nothing is hanging out to pull on hair or tichels. If my band is too long, I will just cut it. Hope that helps! I would also really like to know how you did the first one!! Hi I am an aspiring author and I based the face shape of one of my characters (not sure if I should call her Ḥawwāh or Ḥasidah) off Andrea Troyer. It’s quite a distinctive face shape, so I was just wondering what kind of tichel style would look good on her. Having said that the face shape is based off Andrea Troyer, the character has a darker skin tone and very dark brown hair.